How do you store your planes? I don't have many planes (vertical landings at speed x 2 has kept the numbers down) so I have a little space to store my planes like this. No need for brackets, clips or hangers that could damage the plane. I hook the bungees to the undercart then hang it up - one-handed operation. Yes, it is half a Boomerang II - the re-build is a winter project. 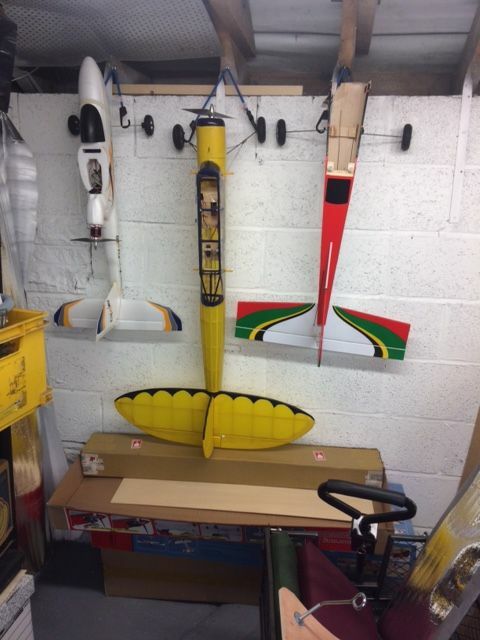 I bought another Boomerang which is in build at the moment. My smaller/lighter electric babies are suspended with loops of sash cord behind the prop (pullers or pushers). 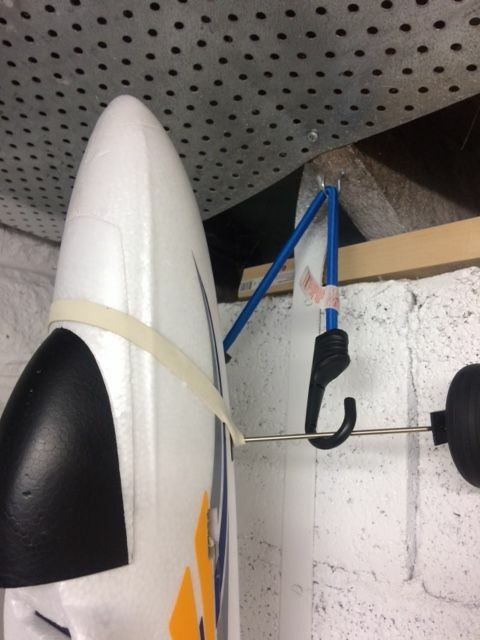 Some of my larger/heavier electric planes are suspended nose down with the loop in front of the fin or tail plane, if there is any danger of the cord cutting into the foam I use a bit of Rx sponge to protect it. 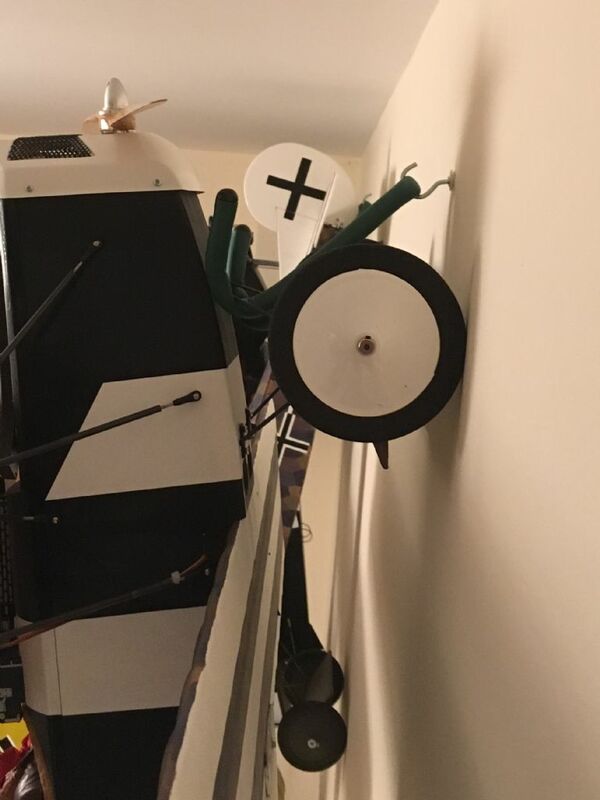 An additional benefit of suspending foamies is they are naturally held vertically, if leaned against a wall long term, not plumb vertical, there is the potential for the fuselage to have acquired a gentle curve when it emerges into the daylight! 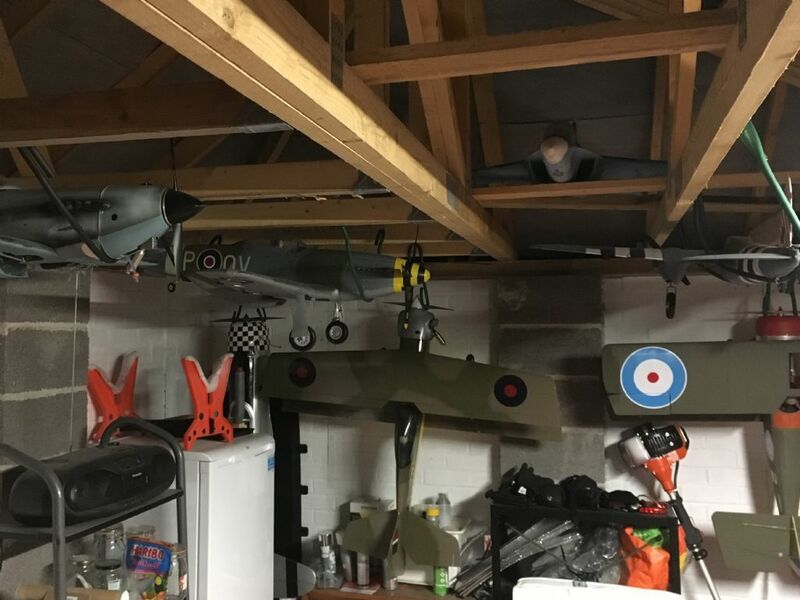 My models are either hung from hooks screwed into joists with a double loop of thick string around the fuselage, front and rear or are hung by their tail with a single loop on hooks screwed into the wall. In the ceiling mounted cases they are in flying attitude, with the wings on, or one piece models, in the latter case the fuselages are vertical, stored wings off. The wings are either on shelves or stacked against the wall. To get them down for flying I have a length of stout dowel with a hook on the end, to pick up the loop of string and fish the model down. It's the best system that I've found, having tried several. 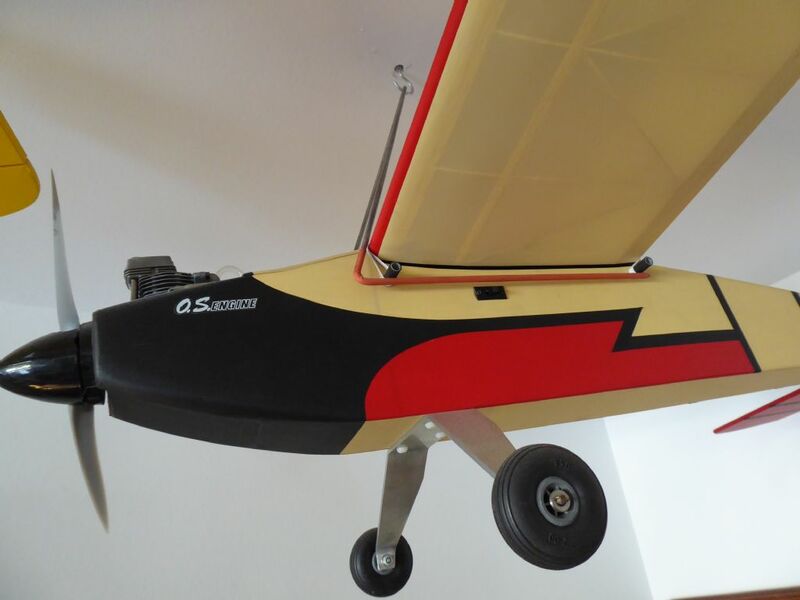 Haven't encountered any issues with damage to foam or balsa surfaces with this method, some of the heavier models are suspended by the undercarriage, if appropriate. My fuselages stand nose down on the floor. I have a rack made out of two strips of wood with 1/2" dowels in on which the wings rest. Yes Peter. The arrangement shown above is OK for electric models, but for ic you really need the fuselages to be nose-down. When we lived in a chalet bungalow, there was a space above the double garage with I made into a building room. In the garage below I fixed 50mm webbing tape between the 10" deep joists & stored around 5 medium sized models there. I hang my models nose up all ic , any potential bad stuff runs down to on the crankcase back plate and not on any critical bits, also any fuel left in system can't run out(can never drain my fuel tanks out 100%) and i don't have rust problems. Mind you they are all 4 strokes bar one these days. There is no doubt about the No1 hobby in our flat. 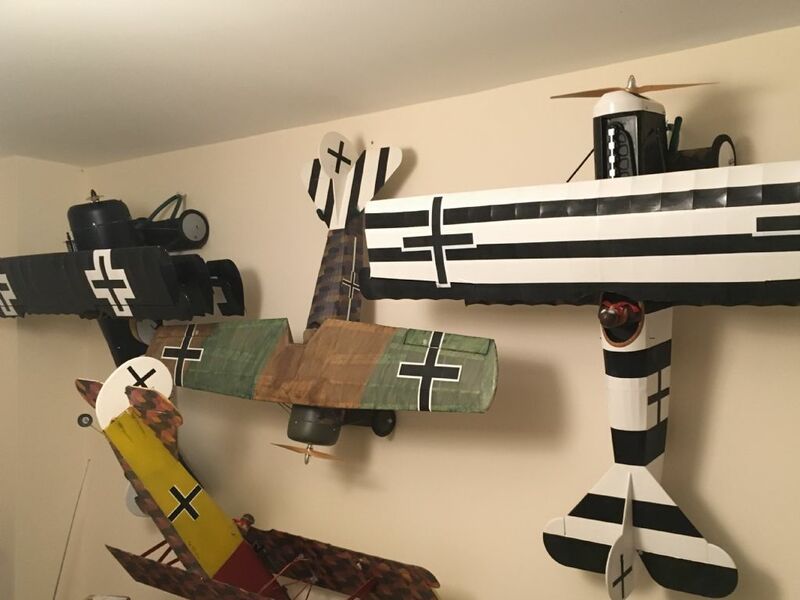 These are all aircraft that I have built. There are four more in the workshop (spare bedroom) and four other in the bedroom. Suspended like this from hangers made from piano wire. 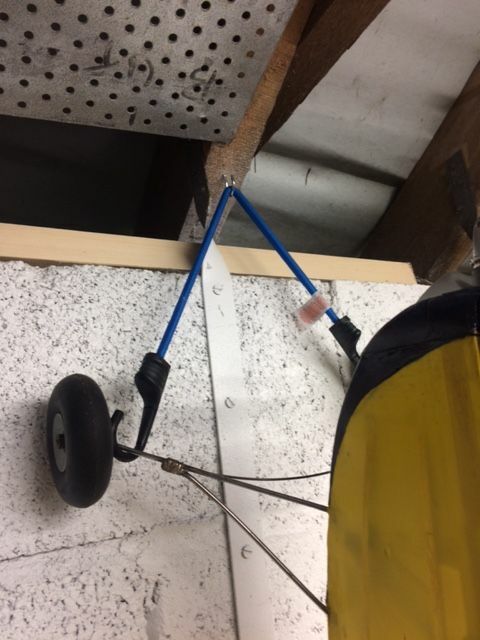 To prevent any damage or rust staining, the section supporting the wing is covered in heat-shrink and here (this is a Veron Robot) the wings are banded on, the hanger goes under the dowels to take the weight off the bands. With planes that have bolted wings the hanger goes directly onto the wing and I make sure during built that the wing is at least sheeted a bit wider than the fuselage to give the hanger something to bear on. The bands are not the rubber bands used when flying. They are elastic bands bought from a haberdasher that are used in waistbands as these are not affected by UV light and do not pop-off unexpectedly. It happened once! I have more ceiling space which is just as well. Ditto re the hooks in the garage joists and the 1/2" dowel wall rack for wings. Not being vertically challenged I could reach all the hooks to move fuselages, until another model or two materialised and the space beneath disappeared. I remembered Leccyflyer's "length of stout dowel and hook" and swung into Homebase this am; broom handle, c. 1" dia, with its own plastic hanging hook, £3-something. Cheaper than dowel. No trace of alleged tubs of Pollyfilla Advanced, exponentially better than specialist balsa filler; tubes from B&Q. Begs the question, what was the Retarded filler like? A bit slow? Twin Pulse - fuselage stored nose down but wing (with engines) is stored stood on its tip. Pulse 125 - stood on its nose in the shed as there is no room anywhere else. Once i eventually get my own 'hangar' sorted they will most likely all end up hanging from their props. or be left horizontal on some sort of shelf/hung from the roof. I would never hang IC models nose down as the clunk will sit folded back and may stick that way, nose up lets the clunk pipe keep straight. I have put a length of brass tube as the feed pipe in the tank. This stops it folding back. I thought the main problem with storing i.c. models nose down was possible damage from exhaust by-products (e.g. nitric acid) running back into the engine from the silencer? An American style walk-in clothes closet is ideal for storing model aircraft. One cupboard will take lots of fuselages stacked vertically against the walls and there is usually a shelf above the clothes rack that will take a stack of wings. And there is still room to hang quite a lot of clothes in front of the fuselages. (Mind you, those who favour lecce planes will not have the added benefit of their clothes smelling of glow fuel!) 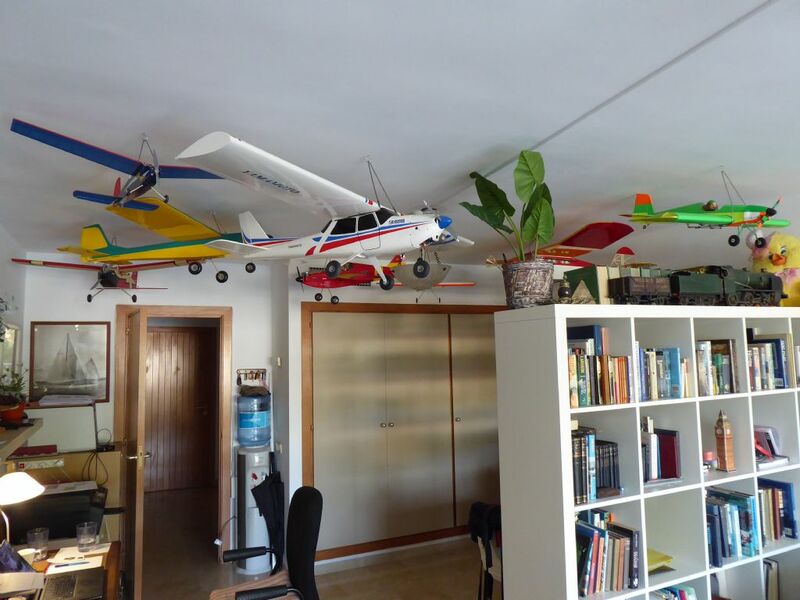 Then you just close the cupboard doors and you would not know there are any model planes in the house. Now, if I had one of they, I reckon my beloved would be in first with her shoes and bits.